Is this as good as it gets? Can I do better with my life? These two questions nagged David J. Figura, as he grappled with a troubled marriage and considered an affair. He was also burned out at his job, lonely and resentful because of his lack of meaningful friendships. Sound familiar? In So What Are The Guys Doing? Figura bares all and relates the changes he made in his marriage. He tells of the radical steps he took to make more male friends and the risks he took in his career to turn things around-and also of his conversations with more than 50 men who were dealing with many of the same issues. It is his hope that this book will inspire other men to seek happier, more satisfying lives. "I love this book. Its message to middle-aged men about the importance of getting and keeping their male friends close is much needed." John Gray, best selling author of Men are from Mars, Women are from Venus "For far too long, a man's quest for passion has been disregarded as a 'midlife life crisis.' 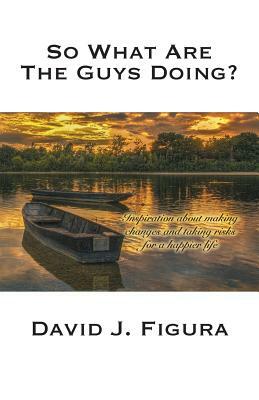 Against the backdrop of David J. Figura personal transformation, he offers guys practical and heart-centered adviceon finding a deeper connections and joy in life. A must read for the men and the women who love them." Sheila Applegate, MSW. and award winning author of Enchanted One: the Portal to Love "David Figura has uncovered a difficult and uncomfortable reality that many men share in their mid-life years. For those who are struggling, the light he sheds-I think-will be a great solace." Tim Green, ex-NFL football player, best selling author, TV and radio personality.